This little Calendar for your Desktop can show your appointments and tasks from Outlook directly on top. ..so you don’t loose track of your things you want to do. 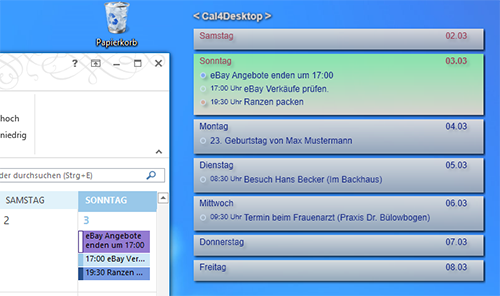 You can open each appointment or task directly from this application.Cal4Desktop can collect appointments from multiple calendars and taskfolders also items of your public folders. If your tasks have a due date, the program will show it on the corresponding day. If there is a birthday, Cal4Dektop will calculate the age of the person for you. You can change colours and fonts, also the number of days that should be shown is changeable. The calendar let's you navigate trough the times with the two arrows. 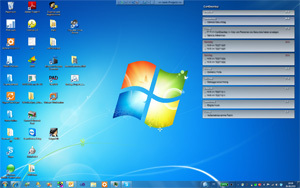 If you are using Outlook 2007 or 2010 you will also see Mails on your desktop you have marked with a flag. Cal4Desktop will use the colours of your categories from Outlook so you need not change anything in mind. Please load the x86 version from here (ClickOnceDeploy). If you are using Outlook x64 please download this Version.